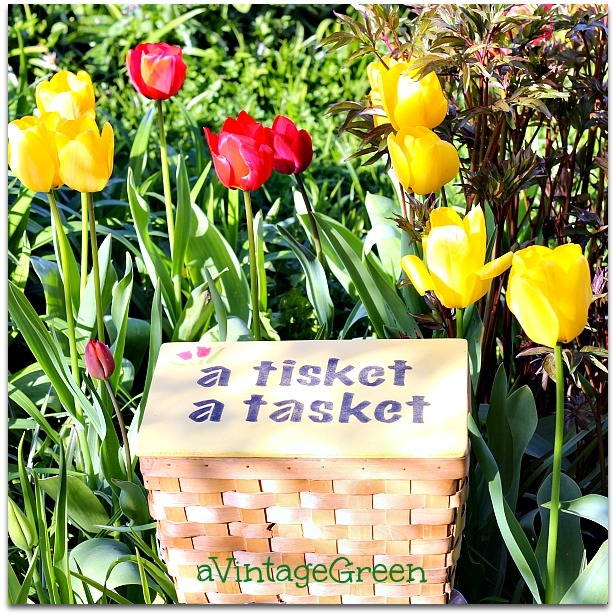 One red tulip was bending over, just in time to join the small basket with a tulip and a tisket a tasket stencilled on the yellow lid. May 8 is Mother's Day and this thrifted basket may be used for a sweet bouquet or perhaps hold a gift of chocolate, a pretty mug and some special tea, all surrounded by pretty tissue paper. 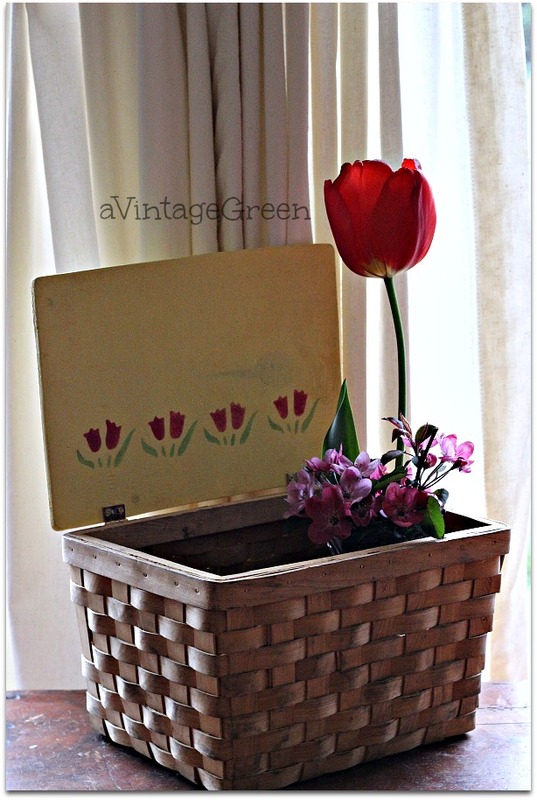 The rather worn and thrifted basket started us thinking of adding a lid and progressed. A lid was cut from a piece of plywood flooring left over from our 2007 kitchen reno and 2012 update. Some left over yellow paint used to paint the outdoor trim above/below our replaced windows was used to paint the basket lid. DH traced the basket top on a piece of 1/4" plywood, cut the shape out with a jig saw and sanded the edges to make the basic lid for the basket. 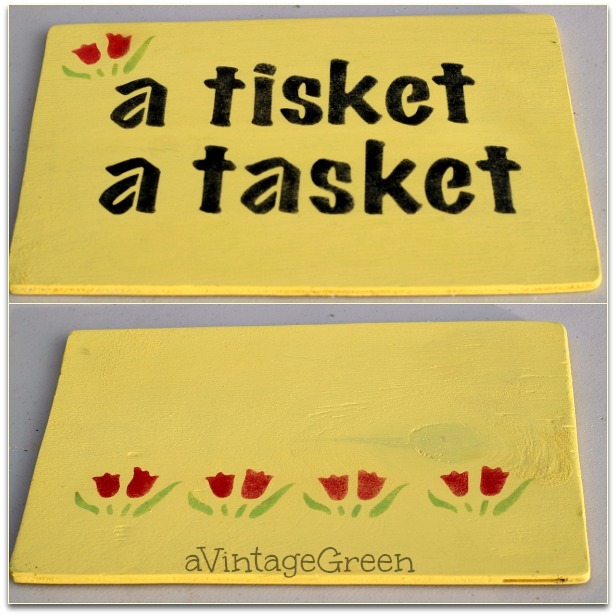 I painted the lid, added stencilled words and flowers and used clear wax for the finish. 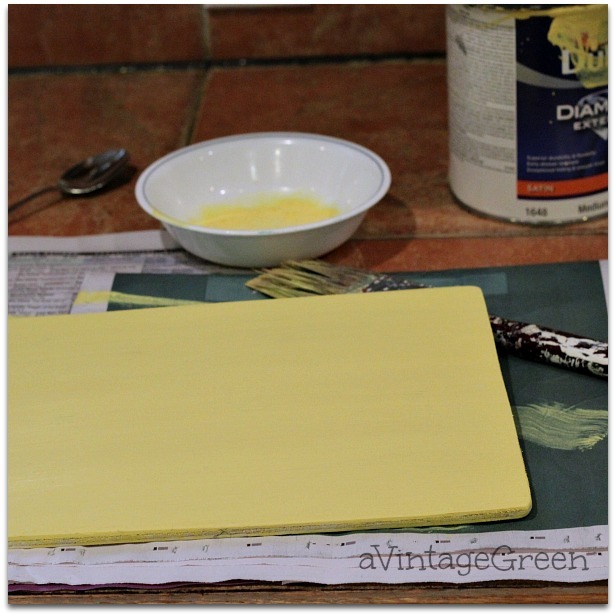 The wash used was 1 tsp water/one brush dipped in latex paint, mixed. 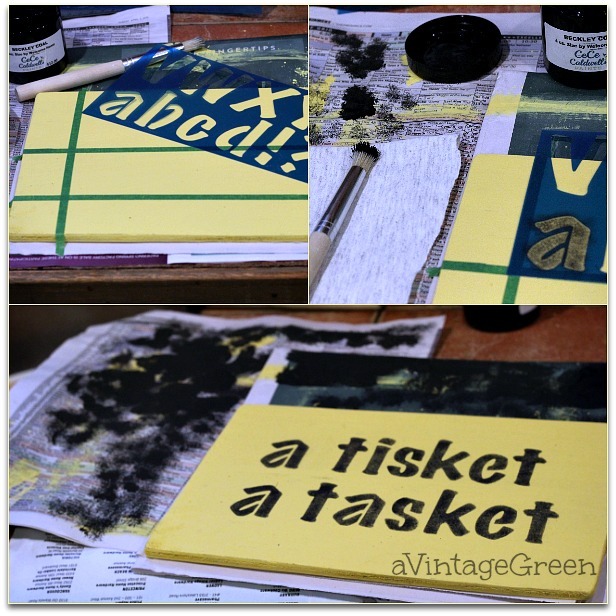 I gave each side and the edges 2 coats of the yellow wash.
Pre-planned the letter positions (see paper plan 3 pictures up), used green 1/4" tape to make sure each letter was placed on the straight line and stencilled a tisket a tasket keeping the paint VERY dry for stippling each letter (dry brush stencilling). Added stencilled small tulips to the lid inside and out. Tulips and late day sunshine made a pretty background for the basket. DH added small hinges to the basket lid. Oh my goodness dear Joy! What a precious basket and lid. 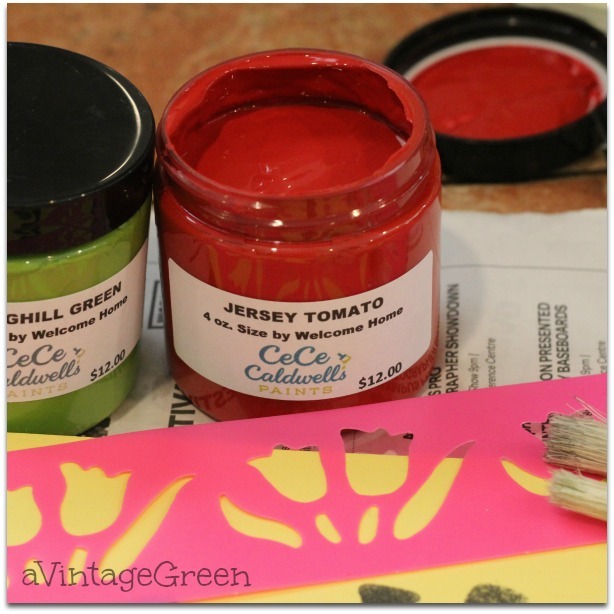 Your stenciling is just perfect. 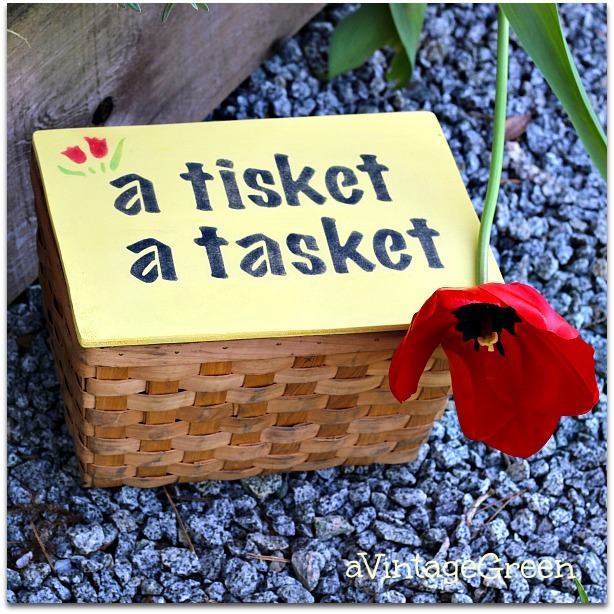 Now I am wondering if this could be a picnic basket too-love the saying! Thank you oodles for joining us in Thoughts Of Home On Thursday! I cannot decide if the tool caddy or this adorable basket is my favorite. I now feel the need to go stencil something. You and your husband are a good team! Joy, this basket is way to cute! Thank you for linking up at Funtastic Friday! 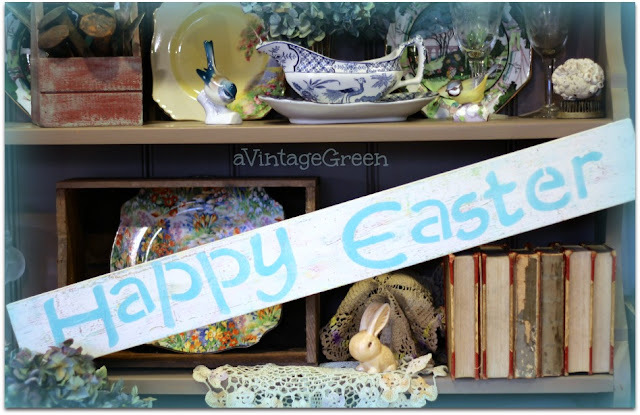 I just love how spring time opened up to your idea and gave you the perfect backdrop! Lovely! I know what I'll be humming for the rest of the day. That is so pretty!!!! I am stenciling more these days! However, I bought a set of stencil letters that came in four sheets and I accidentally threw away one of them!!! I hope to replace them soon!!! I could not make my words without that ONE sheet!! Silly me! Watch what I roll up after art!!! Joy,this is so cute and now I have that rhyme in my head! Happy Friday. A darling little basket! Your post is such a happy addition to Thoughts of Home on Thursday. Thank you SO much for sharing the joy. 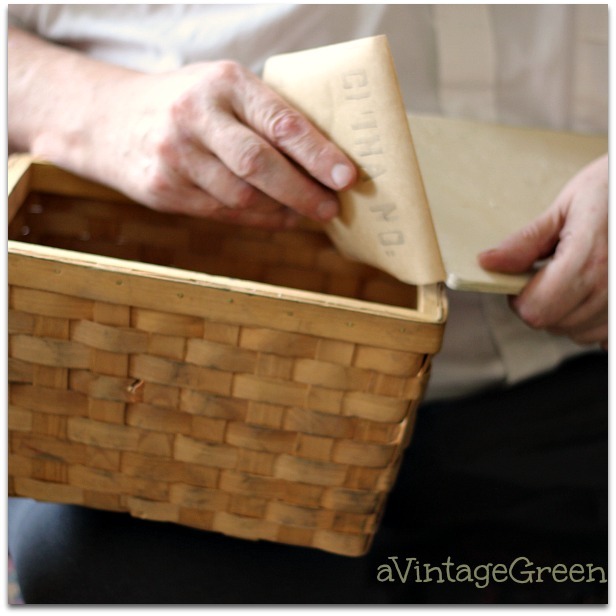 Love your up-cycle of a vintage basket. So adorable. Great look! Thanks for sharing at Home Sweet Home! Thanks for sharing your adorable basket with SYC. 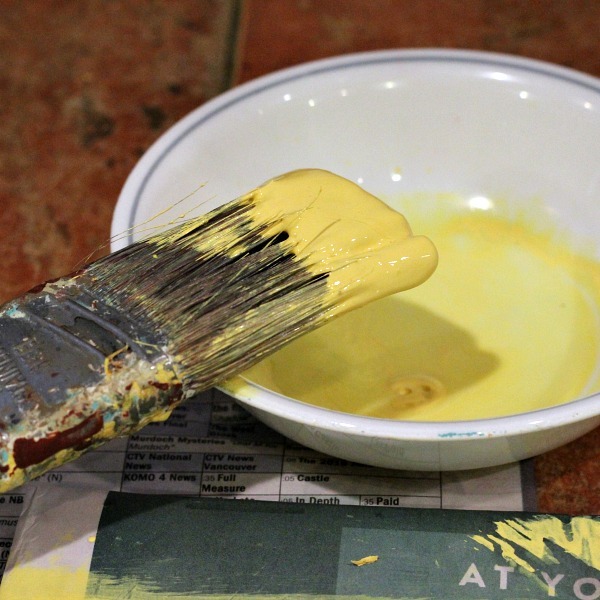 Now I want to paint a sign tomorrow after seeing yours. How pretty! I love the colors you chose. It's so bright and fresh now.Pinning. Thanks for sharing at Snickerdoodle Sunday! 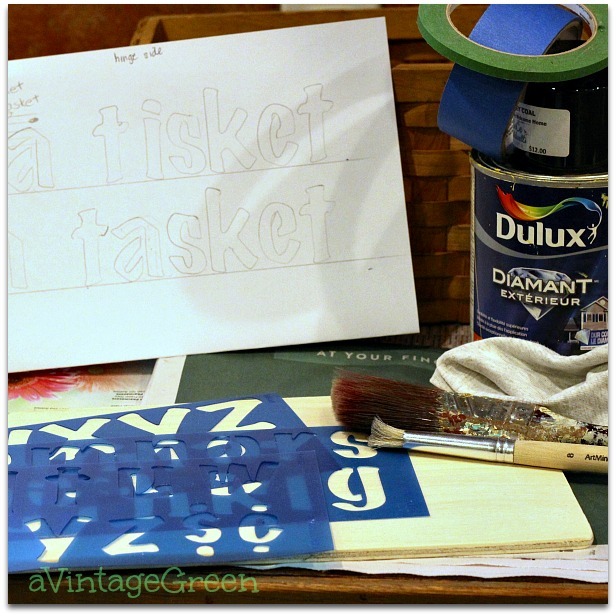 You are a pro with paint and a stencil! It looks flawless! Thanks so much for sharing at Inspiration Thursday! So sweet Joy. I love the combination of red and yellow! Thanks for sharing with SYC. 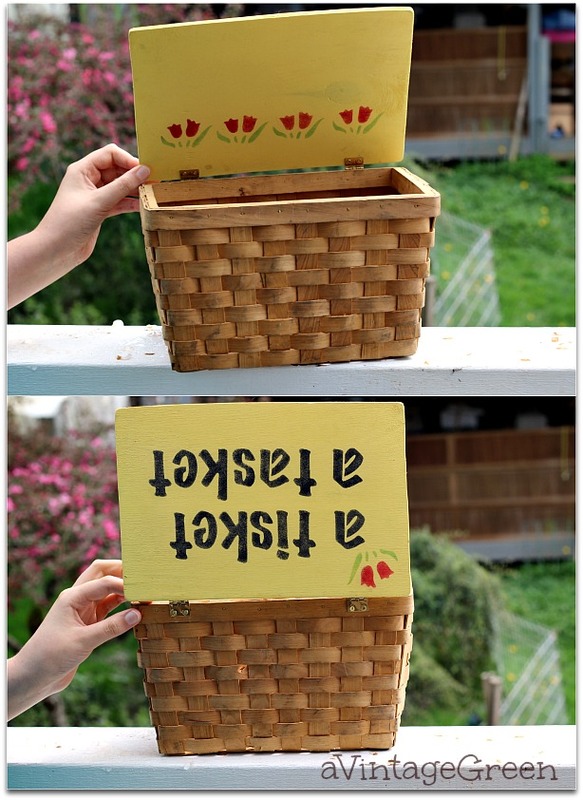 Popping back by to tell you, I'll be featuring your lovely basket makeover at this week's Snickerdoodle Sunday Party. Hope to see you there!